Few days ago, I wrote about the relaunched StarTime DSTV App, that allows users to stream many different kinds of channels with the use of any Android device. Although, it requires data for you to be able to use it. Today am gonna show you another way of using this DSTV app without struggling for much data, Even as that, we are still working on how users can use this very DSTV app for free. Hey, It doesn't end there, you can also watch music videos on Youtube, and as well live matches online. Etisalat just introduced Unlimited video data pack for streaming videos with the use of Android and PC devices. 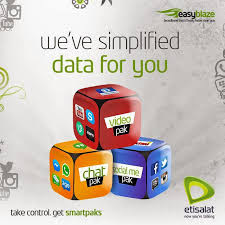 With this plan called Etislat video data pack, you can watch your favourite videos, Movies and live matches without any limit, as it is unlimited when you talk of its data but last for 2 hours with the billing rate of #400 only. READ ALSO: Free Top 5 Nigerian Sites To Download Nollywood and Ghanian Movies to mobile Devices and PC. How can I subscribe for this data plan? To stream videos online, simply dial this ussd code *229*3*5# to subscribe. That's all, enjoy it while it last, keep on checking our latest update because we are working on how to use this particular etsalat video data plan for downloading apps and anything you wish to get online.